Rajkot, India, in a partnership with EMBARQ India, launched its first unified auto-rickshaw fleet. Photo courtesy of EMBARQ India. One week ago, with assistance from EMBARQ India, the city of Rajkot, in partnership with Nirmal Foundation, launched the G-Auto service, debuting a new fleet of auto-rickshaws, featuring a unified brand and dial-a-rixa (call-in) service, on July 13. The initial fleet includes 50 auto-rickshaws. The service will scale-up in the coming months and is expected to reach a fleet size of around 500 auto-rickshaws at the end of the first year of operations. Rajkot, a city of around 1.3 million people in Gujarat State, India, currently has a patchwork collection of auto-rickshaw fleets and companies, with more than 12,000 auto-rickshaws currently operating, many without formal fare structures or employment benefits for drivers. G-Auto service will continue to expand its fleet in the coming months, with support from EMBARQ India and the Rajkot Municipal Corporation (RMC). This partnership, fostered by EMBARQ India, has coalesced over the past eight months to allow for safe and reliable auto-rickshaw service for the people of Rajkot. To find out more about this game-changing partnership, we sat down with Akshay Mani, EMBARQ India Project Manager – Urban Transport, who helped guide the launch of the new Rajkot fleet and was the lead author of an EMBARQ report, “Sustainable Urban Transport in India: Role of the Auto-rickshaw Sector,” detailing the mobility benefits of auto-rickshaws in India. Reliable meter-based auto-rickshaw service, operating under a unified brand name, with trained drivers and without refusals. Dial-an-auto-rickshaw service, with auto-rickshaws available for doorstep pick-up at any time of day. Reliable feeder service at high-demand transport hubs, such as bus stops, intercity bus terminals, railway stations and the airport. How does this size of the new G-Auto fleet compare to other dial-a-rixa services? Most of the dial-a-rickshaw schemes that have been implemented in other cities are operating at a small scale, because of the infancy of this concept for the auto-rickshaw sector. It is expected that with increased focus on creating the enabling regulatory, financial and institutional environments, these services will be able to scale-up to become sustainable and achieve their intended benefits at the city level. The continued expansion of G-Auto in Rajkot could serve as the game-changer, paving the way for the expansion of these types of services in other cities. How does this system integrate with public transport (buses and trains) and private transport modes currently in Indian cities? Auto-rickshaws play an important role in providing feeder or “last-mile” service to other modes of transport, as well as providing an alternative to door-to-door automobile use. This is particularly important, given the unprecedented growth of private motor vehicles in Rajkot, particularly two-wheelers, and the problems resulting from this trend, such as congestion, air pollution, road crashes, traffic-related injuries and fatalities, and noise. Why was Rajkot chosen to roll out the first dial-a-rixa service in India? 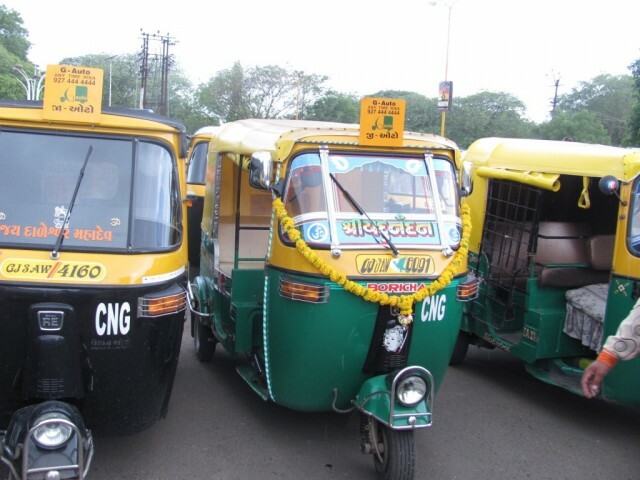 EMBARQ India entered into a partnership with the Rajkot Municipal Corporation (RMC) in April 2011 to engage with the city as a technical partner and work closely to catalyze and help implement reforms in the auto-rickshaw sector. Rajkot was selected as the target city for this project because of two key factors. First, Rajkot is a medium-sized city with a rapidly growing population and unprecedented private motorization with room for vast improvements to auto-rickshaw service. Second, in Rajkot’s municipal government, we early-on identified a champion for this program, whose vision aligned with EMBARQ India’s mission to improve public transport in the city. In the end, the leadership and commitment shown by RMC played a crucial role in the successful launch of the service in Rajkot. What best practices in fleet management did you apply from other Indian cities? G-Auto service has been operating in Ahmedabad for a few years. The service in Ahmedabad has demonstrated that organizing existing auto-rickshaw drivers under a common brand can be a successful approach compared to alternate approaches, such as multiple fleet companies, each with its own fleet of auto-rickshaws. The lessons learned and experience gained in Ahmedabad’s successful, unified fleet will be useful in the coming months as we scale up service in Rajkot. What can auto-rickshaw fleet services operating in other cities learn from the new service in Rajkot? The greatest learning that G-Auto service can bring to other cities is the effective use of public-private partnerships for the implementation of fleet auto-rickshaw service. In particular, the leadership role taken by the city government could serve as a game-changer in the way in which services are implemented in other cities. The city introduced reforms in a sector that does not fall under its direct regulatory purview by working with various city stakeholders, such as the regional transport office, traffic police, driver unions and service providers. For fleet services operating in other cities, it shows that it is important to engage with all stakeholders in the sector, including the local government, to get regulatory and institutional support for scale-up of services. What does this auto-rickshaw fleet service mean for sustainable transport in Indian cities? A high quality auto-rickshaw service in cities is extremely important to achieve the twin goals of sustainable transportation: promoting the use of public transport, and reducing the reliance on private motor vehicles. Auto-rickshaws serve both these roles, as a feeder service to public transport for daily commute trips, and as an alternative to private motor vehicles for occasional trips. Achieving these twin objectives for efficient and sustainable auto-rickshaw service will require overcoming the challenges of organizing a tangle of disconnected auto-rickshaw fleets into a unified service. Current auto-rickshaw schemes in India lack the benefits of economies of scale (which are also the benefits of fleet management) without the ability to introduce technology-based services, such as dispatch and brand control. They also lack adequate driver training, and they suffer the environmental impacts of poorly maintained vehicles. All these challenges can be addressed through the promotion of a unified fleet of auto-rickshaws, which operate under a common brand, enhance public perception, result in better quality of service for passengers, bring benefits to drivers, and mitigate environmental impacts. Indian rickshaws are known for their artistic decorations. What are some of the ways Rajkot fleet drivers can customize their vehicles as part of the new rebranding? Efforts to rebrand rickshaws in this new service should be driven by the vision to provide a better commute experience in the rickshaws. Art can play a key role in this, through better looking designs, pictures and paintings, which in many cases can be drawn from local culture. Perhaps more importantly, making design changes to improve passenger comfort, as well as providing entertainment, such as magazines and music, can go a long way in enhancing the brand image of the service and providing a unique and improved commuter experience. Correction, 07/23/2012: An earlier version of this post incorrectly stated that the population of Rajkot, India was 1.4 million people. It is actually 1.3 million.